With only minutes before inaugural national animal welfare hui concluded, Animal Evac NZ made a lonely plea to Hon. Meka Whaitiri (Associate Minister for Agriculture). Not only did fellow animal advocacy groups agree, but the Minister has taken our feedback on board and ensured that improvements to our animal disaster management arrangements be given considerable attention. For close to nearly a decade, our people have lobbied for improvements to animal disaster arrangements which have largely fallen on deaf ears. The wake up call of the Edgecumbe flood has show New Zealand has far from a best practice animal disaster management system, in fact it has much work to be done it. However, with fresh political interest we see hope for the first time and look forward working with government to ensure we can go from being mediocre on paper, to best practice in real practice. 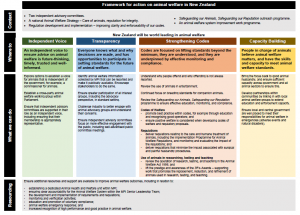 Here, you can view the Animal Welfare Hui Report and Framework for Action on Animal Welfare.